"I am so happy to be working with clients that allow me to utilize my expertise in interior design, drafting and detailing. I am passionate about space planning projects and look forward to the opportunity to bring that excitement into your next project." 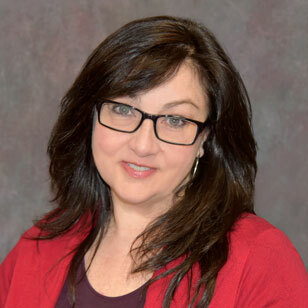 A graduate of the Harrington College of Design, Janine is a seasoned professional with design and management experience in projects that range from small closets to whole house new construction cabinetry. Whether your needs are for renovation or new construction, Janine consistently puts 110% effort into every project. If you want someone who is ready to pull out all the stops for you, you will be happy with Janine. 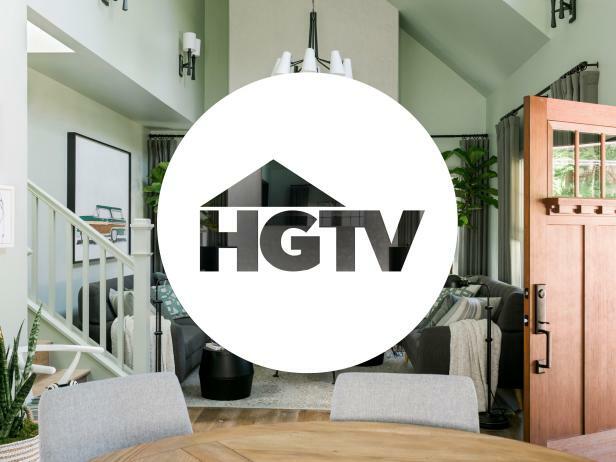 Janine's work has been featured on popular home renovation TV shows like Chicago's own Windy City Rehab, where she designed the closets for every episode. Samples of these designs can be viewed by scrolling down or clicking here. 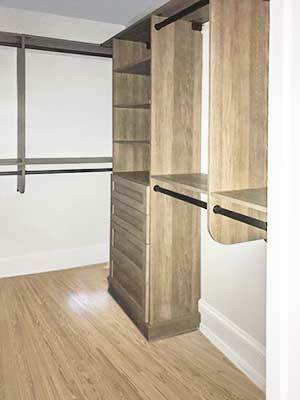 This master closet design is an open closet style that puts everything on display rather than conceals. The center closet island is the focal point and is a showcase with frameless glass cabinet doors, glass shelving, and custom LED lights. The closet system is in a Haze laminate with a Vintage style laminate countertop for textural variety to complement the other textures around the room. Her side of the open master closet has a surplus of storage with double hanging spanning the wall along with corner storage with shelving. Longer items such as slacks can be hung in the longer hang section and accessories are stored neatly on the shelves. This beautiful master open closet is centered around a gorgeous closet island complete glass cabinets, glass shelving, lighting and more exquisite details. Shoe cubbies border the island offering both convenience and interesting elements to the design. The structure and drawers is in a misty Haze laminate with a Vintage countertop to add to the variety of textures around the room. Up close you can see the details that went into making this closet island a magnificent showcase. Fine details include glass shelving, glass cabinet doors, custom LED puck lights, shoe cubbies and the varying Vintage laminate countertop. The glass cabinets are frameless glass and open with a touch latch. Mirroring her side, his side also offers double hang with corner storage but also a tall shelving unit for all of his shoes and accessories. The open shelving becomes an elegant display for all of his folded clothing and special items. 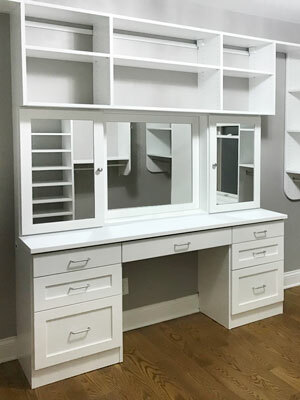 This walk in closet offers a separate built in desk to be used as the perfect vanity to put on make up and store jewelry. Behind the mirror panels are velvet lined backers with hooks for hanging necklaces. 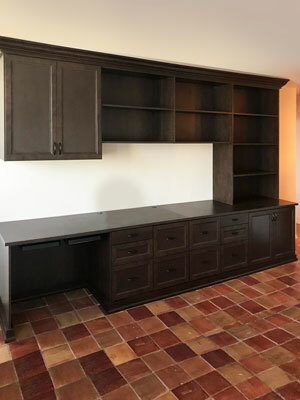 The spacious desk is versatile enough that it can be used as quiet quarters to complete paperwork in the comfort of your very own closet. Closet accessories a great way to truly personalize your closet. 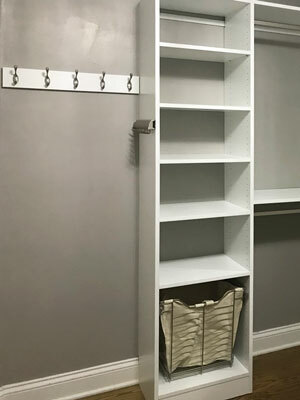 This walk in offers a cleat with hooks to hang commonly worn jackets and sweaters — eliminating the need to deal with hangers every time. A telescoping belt rack neatly consolidates belts in one place. As a solution to keeping clutter to a minimum, a pull-out wire basket hamper has been built into the shelving system. Installing a new wardrobe armoire with unique lighting solves both the storage and privacy issues of this master bedroom. The closet spans one wall of the master bedroom and provides both long hang and medium hang sections along with many shelves. 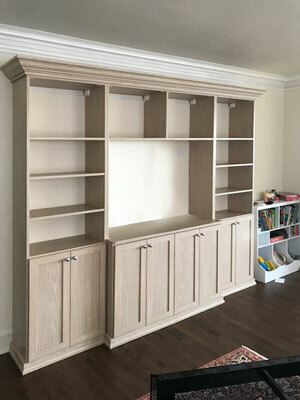 The majority of the shelves are earmarked for shoe storage, but pantry pull-out shelves with scalloped fronts were used for accessories and smaller items. They function in a similar manner to a closet drawer system, storing many of life's essentials. 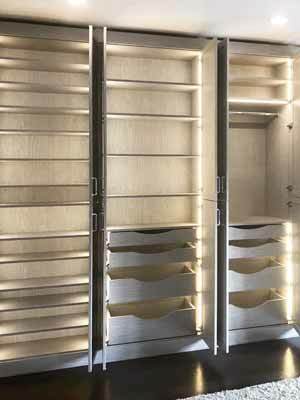 A custom closet lighting system in warm white was included in order to provide both accent and task lighing for the bedroom and closet. 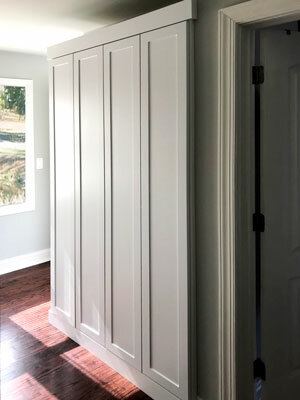 When the doors are closed, this wardrobe armoire closet presents a simple and clean aesthetic to the space. The transitional style is consistent with the decor throughout the home. There is no hint that there were ever any windows present when viewed from the inside. From the outside, it simply appears to any onlookers that the blinds have been drawn. The remaining two windows provide more than enough natural light for the room. A Little Bit of Organization Goes a Long Way! 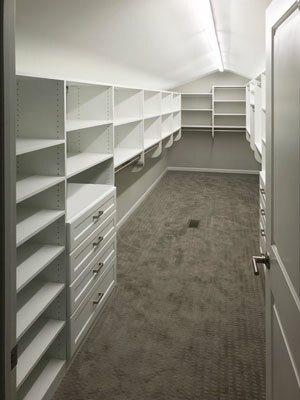 Basements can clutter quickly and it is important to have an organization system in place for chaos control. 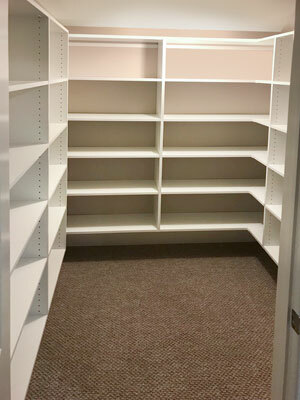 This basement shelves design offers space for all toys and games, bins of seasonal clothing, linen, and more. Corner shelves wrap around the corner to maximize storage. 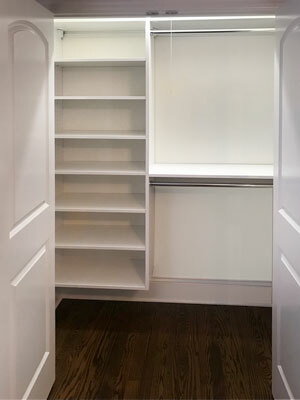 This walk in closet has a simple charm and provides all of the essentials for perfect organization. With both double and long hang, sweater and shoe shelves, and, a built in hamper this design provides all the assets to always keep this closet sharp and clean. 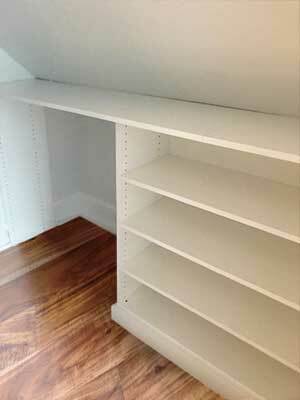 A reach in closet with an added organization system can make a world of difference for bedroom storage. 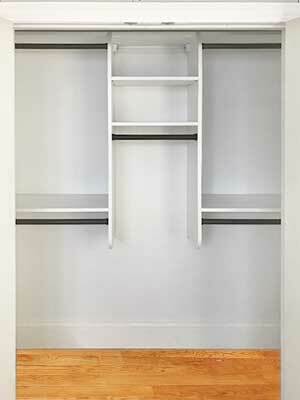 This suspended closet system includes double hang and a set of shelves for all folded items and shoes. 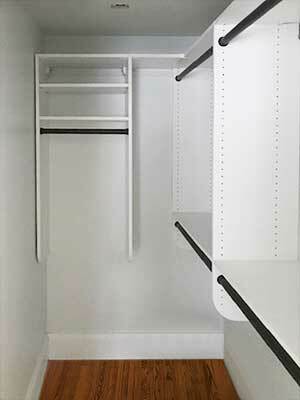 As a suspended system, this reach in closet even offers storage below for a large box or suitcase. 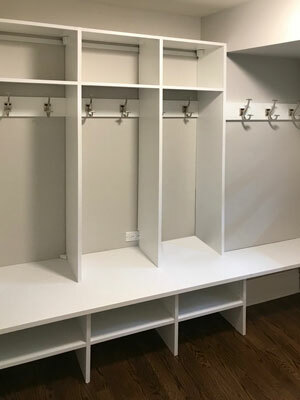 This hallway closet was designated as a storage hub for shoes and does so in an elegant fashion with Shaker Mission style fronts with touch latch doors. 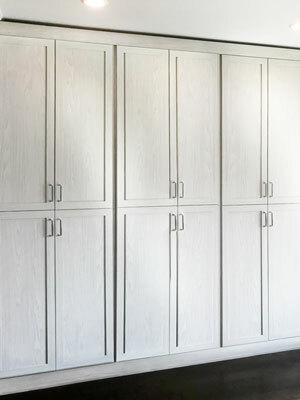 The absence of hardware creates a very clean aesthetic and leaves much to the imagination to the possibility of what treasures this closet holds. This unique space was above the garage and the tunnel-like room provided the perfect opportunity to create a master walk in. The curved ceiling required careful planning for the system to play well with the angles — maximizing the amount of hanging and shelving below the arc. This wall unit was created in a VIVA Casting at 1st Light laminate — evoking feelings of freshness and weightlessness for organization in the living room. The light, simulated wood-grain design offers storage for all media related things, books, decor, and more. The five piece Bella door fronts open up to clear access to electrical outlets and act as efficient wire management. Sophisticated and highly functional — this wall unit is a transformational piece accommodating both living room organization and home office working space and storage. The cocoa laminate is The elegant Cocoa laminate in combination with oil rubbed bronze Crescent handles and Villa doors offers a traditional look to create an enriching space. With children and pets constantly running around, chances are an accident is bound to arise. 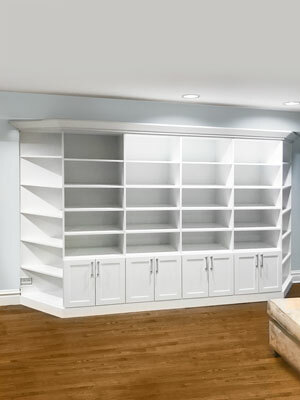 As a safety precaution, this basement wall unit has been expertly designed with corner shelves for this high traffic area. The resulting design not only prevents everyone from bumping into sharp corners, but is also elegant, stylish, and seamlessly fits along the wall. This mudroom design is a great example of how you can add artistry to a simple arrangement. Large coat hooks are pronounced and create a whimsical aesthetic not offered by your standard clear with hooks. The whole family can stay organized with this system providing storage for all outwear, shoes, backpacks, winter gear and more. Wire baskets add the extra organization this compact space needed. 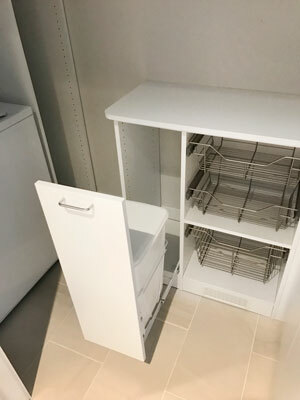 The baskets and cabinets are perfect for towels and linen along with various small items that can be stored neatly in the laundry room as spare storage. Standard handles and slab doors give this laundry room a fresh, clean, and up-to-date look. 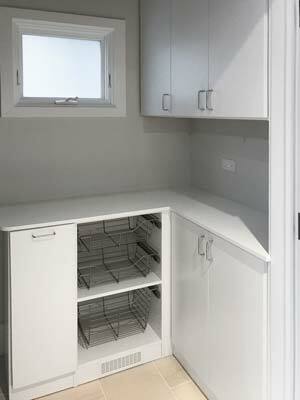 Wire baskets offer additional storage for this small laundry room to really maximize use of the space. A pull-out waste container is a bonus feature to not only conserve space but to make things a bit easier by always having a convenient place to toss lint, dryer sheets, and more. 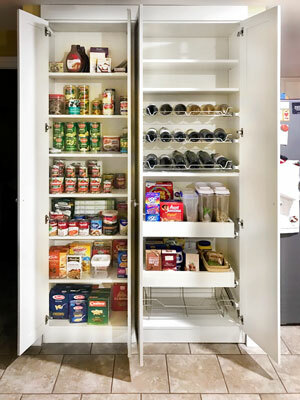 A pantry can be designed to perfection with each of your storage needs being met with personalized features. Janine designed this pantry with tons of shelving, pantry pull-out shelves and a basket, and even pull-out wire wine racks to safely store each bottle. View Janine's work as featured on the popular TV show, Windy City Rehab and other telecasts by the HGTV network. Janine is THE closet designer for Alison Victoria's popular DIY home restoration series. Windy City Rehab renovates a rundown home in the heart of Chicago. This historic Chicago Bucktown home comes with many surprises, however, and when the house unexpectedly has to be taken down to the studs. 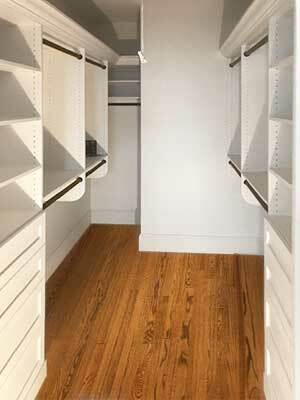 This finished closet is from one of the home's bedrooms. New master bedroom closet for Windy City Rehab's season 1, episode 1 Bucktown Rehab. Historic homes were never originally built with closets that can fit the needs of modern wardrobes. 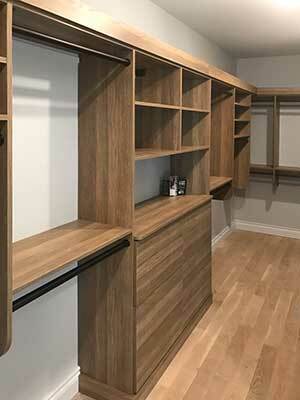 This renovated master closet space should fulfill the storage needs of any dual career couple. Windy City Rehab's season 1, episode 3 Historic Pain or Economic Gain? tackled a 1800s landmarked home in Chicago's Wicker Park neighborhood. 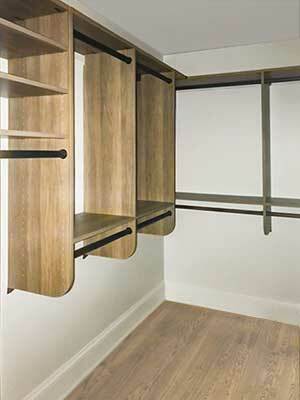 This master closet works well with the house's new modern interior without losing touch with its historic past. This closet renovation was part of a restoration for one of the first landmarked cottages in the Ukrainian Village neighborhood of Chicago. More views of the walk in closet. Did you catch the glimpse of installer Dennis' arm as he builds Janine's masterpiece? Janine added an attic closet to maximize the storage potential of this home and make it function better for modern needs despite the very tight slanted ceilings and sloped walls. 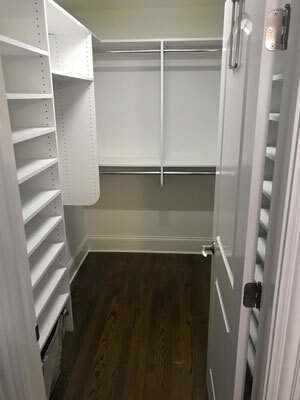 This small walk in closet has been completely renovated using closet oganizers that doubled its previous capacity.